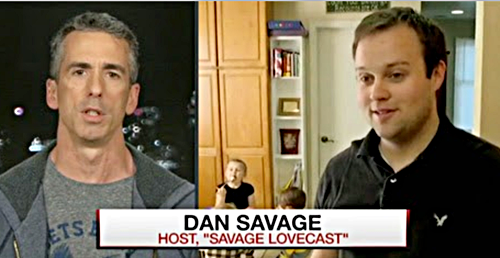 Dan Savage appeared on MSNBC Friday Night to discuss the unfolding drama and hypocrisy surrounding reality TV’s Duggar clan in the wake of allegations that Josh Duggar sexually abused five underage girls. “Particularly when religious conservatives want to talk about it, they want to point a finger at non-family. They want to point a finger at people that they define as the enemies of families or not from or having families of their own – LGBT people, particularly trans people increasingly with these anti-trans bathroom bills. And that is what the Duggars have dug in on is attacking trans people and opposing this LGBT civil rights bill in Fayetteville where they were out there arguing that the threat to little girls in Fayetteville were transwomen when they knew, when they were covering for someone who had demonstrated, at least at that age, was a threat to little girls himself. Also lets remember that Discovery/TLC had to know as early as 2006, because that’s when the family went on the Oprah Winfrey Show to promote their TLC show, and Oprah’s staff alerted law enforcement after a tipster alerted them. A full investigation was done, but charges weren’t filed because it was after the statute of limitations.